SKL is a boutique US and Canadian tax advisory firm. Our tax lawyers and accountants can assist you with your US and Canadian tax issues, including tax planning, IRS and CRA reviews, and yearly tax filings in both countries. Our particular specialty is helping US citizens in Canada solve their tax problems. SKL has been helping clients solve their cross-border tax problems for over 40 years. Many of our lawyers and accountants have been with the firm for decades, while others joined SKL after practicing at leading international law and accounting firms. Meet our team here. We were one of the first firms in Canada to specialize in cross-border tax issues, and our experience gives us tremendous expertise. We’ve written numerous informative articles and even published a book on taxes for US citizens in Canada. Recognizing our ability to bring clarity to the tax world, the Canadian media regularly ask us to help explain tax issues to their audience. We take a personal approach to tax. We love getting to know our clients and explaining their tax situation in a way that makes it easy for them to understand. Contact us today to find out how we can make your life easier. 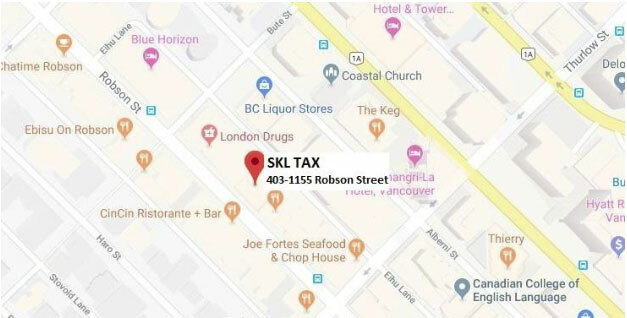 SKL Tax is pleased to announce that our new office is open for business as of December 3, 2018. We are now located at 403-1155 Robson Street, Vancouver, BC V6E 1B5.